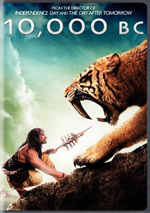 In the prehistoric past, a young man struggles to return home after being separated from his tribe during a buffalo hunt. Those of us who love dogs understand the tight bond between human and canine. In 2018’s Alpha, we find a fable that speculates on the origins of this connection. Set during the last Ice Age, tribal chief Tau (Jóhannes Haukur Jóhannesson) takes his teen son Keda (Kodi Smit-McPhee) out on his first hunt. This doesn’t go well, as an incident leaves Keda lost and left for dead. However, Keda survives, and he needs to withstand harsh elements to make the trek back to his clan. Along the way, he meets a wounded wolf that he helps, and this starts a link between man and animal, as the pair struggle to survive. If I looked hard, I might find a “caveman movie” that I liked, but there’s a good chance I’ll come up empty. The genre never much interested me, and I saw no reason to believe Alpha would break that streak. Though the canine side of the story gave it potential. As I alluded at the start of the review, I adore dogs, so a story in which man and pooch bond opens doors to charm me. Charm me Alpha does, and not just because of the dog parts – though those go a long way. At times, it feels like the script checks off boxes – the first game of fetch! the first begging for scraps! - but the film pulls off these milestones in such a likable way that I can forgive its clunky nature. Along with brother Allen, director Albert Hughes made his name with 1993’s gritty urban drama Menace II Society. Alpha represents Albert’s first movie since 2010’s Book of Eli and also his initial directorial foray without his brother. I don’t know why the siblings went their separate cinematic ways, but Hughes does a nice job with Alpha. I won’t say he avoids all forms of sentimentality, as the film can veer toward minor melodrama at times, but I think he paints the tale in a natural, convincing manner that manages to avoid sappy pitfalls. The actors help, and in particular, Smit-McPhee handles the lead well. Though he gets stuck with a fairly standard “coming of age” narrative, he manages to bring a nice honesty to the role. All of these factors make Alpha a surprisingly likable adventure. While it probably works better if you love dogs, it does enough right in other regards to prosper regardless of your feelings toward the pooches. Alpha appears in an aspect ratio of approximately 2.40:1 on this Blu-ray Disc. The movie delivered a gorgeous presentation. Sharpness worked exceedingly well. If any softness impacted the presentation, I didn’t see it, as I thought the image remained tight and accurate. No signs of jagged edges or moiré effects materialized, and the movie lacked edge haloes. Print flaws also failed to become a factor. Even with the prehistoric setting, the usual teal and orange palette dominated, though not to a goofy Michael Bay extreme. Given the stylistic parameters, the hues seemed well-rendered. Blacks came across as deep and firm, while low-light sequences managed nice smoothness and clarity. I felt highly impressed by this top-notch transfer. Almost as good, the movie’s DTS-HD MA 5.1 soundtrack offered an immersive experience. Note that we get no English option, as the movie went with the tribe’s “Original Language”, translated via English subtitles. Oddly, we do get French and Thai tracks, which seems strange – the disc includes those subtitle options as well, so why not stick with the “Original Language” for everyone? I’m glad Sony didn’t take the easy way out and throw in an English dub. With a lot of action sequences, the soundscape came with many opportunities to shine. The massive stampede early in the story acted as the showiest and most aggressive of the bunch, but plenty of other scenes brought out involving material that filled all five channels in a broad manner. Audio quality worked fine, with dialogue that appeared natural and concise. Music came across as full and rich, with clean highs and deep lows. Effects became the most impressive aspect of the mix, as those elements showed accurate, dynamic material with bold low-end at times. This turned into a strong soundtrack. The disc includes both the film’s theatrical cut (1:36:30) and a Director’s Cut (1:35:19). You read that right: the Director’s Cut runs shorter than the theatrical release. That’s not unprecedented, but it’s unusual. Although I saw the film theatrically, I don’t know it well enough to specify the changes. Given the minor difference in running time, I must assume they’re small, and it’s possible the shorter length results entirely from an abbreviated ending. The theatrical version includes a coda that doesn’t appear in the Director’s Cut. Five Deleted Scenes span a total of nine minutes, nine seconds. Among these, an “Alternate Opening” offers some clunky and unnecessary exposition. An “Alternate Ending” finishes the story on a downer note – it incorporates the more hopeful elements of the coda from the theatrical cut I mentioned but still concludes matters with too much unhappiness. Neither should’ve been shot, much less considered for the film. The other three sequences focus on Keda’s thoughts, with an emphasis on dreams. They’re not especially compelling. We can view these with or without commentary from director Albert Hughes. He gives us some thoughts about the scenes and why he cut them. Hughes delivers decent insights. Four featurettes follow, and Boy & Wolf lasts four minutes, 56 seconds. It includes comments from Hughes, producer Andrew Rona, animal trainer Mark Forbes, and actors Jens Hulten, Kodi Smit-McPhee, Jóhannes Haukur Jóhannesson and Mercedes de la Zerda. “Wolf” looks at story/characters and the lead canine actor. It’s a passable exploration of these areas. With Building the World, we get a seven-minute, 34-second reel with Hughes, Smit-McPhee, Rona, de la Zerda, Jóhannesson, technical advisor Karl Lee, writer Daniele Sebastien Wiedenhaupt, British Museum curator Dr. Jill Cook, language creator Dr. Christine Schreyer, prop master Graham Coutts, visual effects supervisor Jeffrey Okun and actor Spencer Bogaert. The show examines attempts to depict a pre-historical period and some production elements. We get a reasonable view of the choices made by the filmmakers. Next comes the four-minute, 55-second A Hero’s Journey. It provides notes from Hughes, de la Zerda, Wiedenhaupt, Rona, Smit-McPhee, Lee, Jóhannesson, and director of photography Martin Gschlacht. “Journey” focuses on the lead character as well as Smit-McPhee’s performance. Some decent information emerges but too much of the show exists to praise Smit-McPhee. Finally, Meet Chuck goes for two minutes, 14 seconds and features Forbes. We get some glimpses of Chuck, the canine actor who plays Alpha. It’s a cute real but not one with much substance. The disc opens with ads for Spider-Man: Into the Spider-Verse, Goosebumps 2: Haunted Halloween, Hotel Transylvania 3 and Searching. No trailer for Alpha appears here. 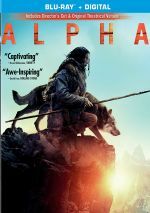 A fictionalized fable of how humans and dogs initially bonded, Alpha brings us an engaging survival drama. It develops in a natural manner and comes with enough action and charm to succeed. The Blu-ray boasts excellent picture and audio along with a smattering of supplements. Alpha turns into a pleasant surprise.